Back-to-school hacks, tips and creative ideas — you can never have too many! Put your organizing hat on and try these 50 hacks that will simplify life for teachers, parents and parent volunteers this fall. Ruler Routine - Write different class activities on the backs of rulers in bold letters, such as centers, small group work, quiet reading, etc. Place magnetic tape on the opposite side and stick these on the front whiteboard according to the day’s schedule so students can get in a routine. Date Reminder - To prompt students to put the date on their work, use a binder ring clip to gather a set of index cards, one for each month of the school year, and another set with a numerical card for each day. Hang them on removable hooks at the front of the room so everyone in class can see the date. Paint Brush Holders - Art teachers can use dollar store toothbrush holders to store brushes while they are drying. Fancy Folder - To create a cheap multi-pocket organizer, take a sturdy pronged folder and add one or two hole-punched paper folders within it. You will have an instant multi-pocket organizer for you or students. Hang Time - Use a hanging shoe rack to create easy access to items such as make-up work pages, extra permission slips and desk work pages. Easy as A-B-C - For younger students, use two-sided picture frames at desk clusters with the alphabet, letter blends and number prompts for easy visual clues. Red Alert - Before school starts, use some neon paper to create four-inch strips that say “Important.” Throughout the year, loop and staple these (airport tag style) around the top loop of students’ backpacks to alert parents that something important is coming home. Measure This - Upcycle a tall metal can to corral rulers. Use a removable Velcro strip on the bottom and attach the other side to a table or desk so that it stays upright. Decorate with washi tape for some color. Lucky Roll - Instead of dice flying all over the tables when you play counting games in math, contain them in small see-through plastic containers — students can just shake the container and turn in upside down to see what they have rolled. Turn It In Pins - Make a chart with student names and ask them to put a clothespin by their name when they turn in their assignments. Keep the clothespin basket right under the chart. It will be easy to scan to see who still has work out. Keep a Spare - It’s great when you have fantastic new glue sticks to start the year, but as the get used up, save those lids — same with markers! If you lose a lid in the future, you have spares! Bottle Cap Art Palette - For painting projects during the school year, hot glue bottle caps in a circle onto a larger plastic lid. During your next art project, you have an instant paint palette to hold small amounts of color. 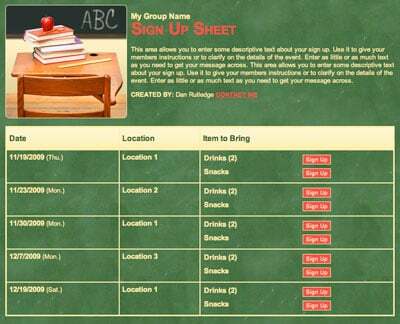 Sign Up Slots - Have parents eager to help? Create an online sign up to designate days of the week (or month) when you’d love to have volunteers. Think about big assignments/events where you will need an extra set of hands and include those on the schedule as well. Volunteer Workstation - After you have your sign up, set up a bin or cart that serves as your “Classroom Volunteers Rock” workstation and include sorting and stapling projects as well as some books to read with small groups for those awesome parent volunteers! Clip It - Add clear adhesive pockets to a clipboard and use them to store hall passes, class lists or encouragement notes that you can take with you on recess duty or to the lunchroom. Also great to use for substitute teachers to keep important information in one central place. Pop Quiz Time - Create dry erase paddles by attaching a large craft stick to a plastic plate. Students can write math answers, vocabulary or other review answers on the back with a dry erase marker and hold it up for the teacher to see. Hula Hoop Review - Who knew these childhood favorites could be used so many ways in the classroom? If you haven’t ever tried these, grab some at a discount store and use them to create large Venn diagrams, group and sort items or practice with math manipulatives. DIY Eraser - Eraser for your dry erase marker keep getting lost? Here’s an easy hack: hot glue a large black pom-pom to the end of the marker, and voila, you’ll always have an eraser at the ready! Repurposed Napkins - Teachers are always low on tissues, so grab a handful of fast food or gas station napkins every time you visit and stuff them in an old large tissue box. They aren’t super soft, so the upside is that it discourages kids from using 20 at a time. Bathroom Break - Use a pencil bag with a clear side as your bathroom pass and stick your pass inside. Clip it to a school lanyard for easy hands-free carrying. Ribbon Place Marker - If you plan to use one notebook all year that students will hand in periodically for spot checks, give them a piece of sturdy ribbon that is 12 inches long (that they can personalize and decorate) and help them hot glue it in the back of the notebook. They can use it as a place marker so when they hand in the notebook to review work, you know where to turn. This can also be used in agendas to mark the day or with a sticky note and gift ribbon for classroom books as a page marker. Suggested Snacks - You may have seen the “Eat This, Not That” books. In that spirit, create an email or printed page for parents with pictures of suggested snacks or treats to send with students. If there are food allergies or restrictions in the class, there may be some items that shouldn’t be sent in school lunches. It’s an easy and visual way to get this message out to class parents. Doorbell Check - If you struggle to get students’ attention, grab an inexpensive wireless door chime to press when it’s time to get all eyes up front. Scratch-off Winner - Who doesn’t love the thrill of a scratch-off card? Find a “recipe” online to make your own, and you can use these as incentives — even for older students. Write on the Wall - Use removable Velcro hanging strips to affix inexpensive plastic black frames to the wall. Place white paper inside the frames, and students can use a dry erase marker to write on the frame. Some ideas: What they learned in class that day or an encouraging message or a joke. Group several frames of different sizes for a gallery wall. An easy and fun class decoration for not much money! On-the-Go Organizing - Sometimes in the just-got-home rush, papers start flying. Save your sanity and put a plastic file organizer in your car with a slot for each child. During the ride home, ask them to get papers out of backpacks and file them. If they are older, they can even separate their papers into categories like finished work and top priority files (things that need to get returned). Get a container with a handle so you can lock and grab. Drop Zone - Another idea to gather papers is to use removable Velcro strips on the back of clip boards and hang these in your drop zone at your child’s eye level. Have kiddos sort papers right when they get home and clip anything you need to see to their clipboard. Pit Stop - To organize and corral before or after-school snacks in the car, use a small shower caddy that can hold a cup and a couple of bags or bars for munching. Sticker Shoes - For younger children, cut a sticker of a favorite animal or cartoon character in two and put the halves in each shoe so children can tell left from right by matching up the sides. Mobile Station - For older kids, ensure a good night’s sleep by having a “charging room” for depositing devices at night. If they find they can’t stay away from night-time phone checks, then the charging room becomes mom or dad’s nightstand! Wipeable Lunch Boxes - Three words: neoprene lunch boxes. They are easy to clean, light weight and often come with an outer zipper pocket for extra supplies. Driver’s Ed - For older teens, going back to school may mean driving themselves and younger siblings. Put a clear, resealable bag in the glove compartment with their insurance card and registration. Include a quick guide with instructions in case they get in a fender bender. If teens are in a panic, it’s good to have this simple step-by-step of what to do after an accident. Your insurance provider may have a printable PDF on its website. Power Hour - For tweens and teens, grab the trusty old kitchen timer and help them get focused by creating a “study hour” for phone-free homework time. Invite them to the kitchen table, set out some snacks and turn on some classical music or a white noise app. Calendar Sync - Get everyone in the family on the same page by syncing your digital calendars before the school year begins. Enter important dates such as teacher work days, holidays, soccer tournaments, scout meetings and more. Genius Tip: Automatically sync your online sign ups with your digital calendar. Textbook Holder - If you get a lot of delivery boxes from your favorite online store, recycle them into textbook or notebook/folder organizers. Reinforce any loose flaps with packing tape and then cut off a large section of one corner to resemble a magazine holder. Cover with colorful contact paper for an extra pop of color. These are especially helpful if your kids are on a block schedule and need a place to leave work at home for days they don’t have that class. Carpool Caravan - It takes a village to raise children, so find yours this school year. Rally a neighborhood group for morning drop-offs or a group of parents whose children are on the same sports team. Your stress level — and your gas tank — will thank you! Genius Tip: Become a carpool pro with these tips and tricks. Lunch Station - During the school year, turn your fridge drawers into lunch prep work stations. The meat drawer can hold all your sandwich fixings or other “main dish” ingredients. Use your veggie drawer for pre-bagged baby carrots or other sliced produce, and keep two “sides” baskets that kids can choose from: one in the fridge for a dairy item like yogurt or cheese sticks and one in the pantry with pretzels or popcorn. Penny for Your Thoughts - Keep some change in your car, and when your teen is giving you the silent treatment, hand them a penny for their thoughts, a nickel for their funny story, a dime for their sadness/struggles or a quarter for their best/worst part of the day. You keep the conversation going with quiet listening and they keep the change! Popsicles on the Playground - Arrange a playdate for kindergartners with a popsicles on the playground event the week before school starts. While these sweet treats are always a welcome relief, bring along some aluminum cupcake liners for kids to poke their sticks through and you will keep drips to a minimum. Hand-Washing Station - Use an empty laundry detergent bottle with the spout lid (the handle for turning on and off), turned on its side full of water for a hand-washing station at outdoor events. Back-to-School Booth - Use a back-to-school selfie booth as a chance to let parents know about volunteer opportunities. Set up a small table with your props and have a jar of volunteer opportunities on slips of papers so they’ll be ready when you send your first sign up for lunch duty. Lend a Hand - Cut out paper hands and write items that would make great donations for the classrooms or school. Include volunteer opportunities that will be open in the near future. Place them on a table for a back-to-school night. It’s a great way to visually advertise your needs! Genius Tip: Follow up with a sign up seeking classroom wish list items. Bulletin Board Bonanza - For recruiting volunteers, create an “I like to…” board with volunteer opportunities listed on a prominent school bulletin board. Include categories such as gardening, reading, donating items, tutoring students, making spreadsheets, calling people and helping with one-time events. Welcome Wagon - Get a list of new families at your school and have a “welcome letter” writing party with your PTA board or a group of parents. Receiving a handwritten note really gets folks’ attention and helps newbies know they are wanted and needed. Busy Box - Use a small metal box and put a collection of Legos, small dinosaurs or horses, even small colored pencils and folded paper inside to let younger siblings have a “busy box” to play with while parents volunteer in an older sibling’s classroom. Change it up so they look forward to seeing what’s in the busy box! Red Light - Another hack if you have a younger sibling tagging along when arriving to the volunteer location is to designate a car magnet as the “wait spot” where they go, touch the magnet and keep a hand on the car as they wait for you to gather yourself and take their hand before getting across the school parking lot. Special Seat - Take along a large placemat for younger siblings to sit on while you help in the office or classroom. Take along a “play and wait” bag with coloring book and pencils or a quiet toy to entertain them or pull out your busy box. 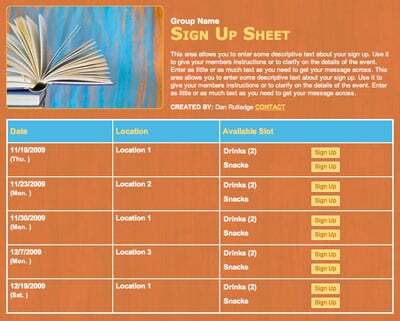 Group Volunteers - Send volunteer opportunities directly through the SignUpGenius messaging system for notes that go directly to parents — they’ll be harder to ignore than a link on social media. Genius Tip: Learn all the ways you can share your sign ups with this quick guide. School News - Parents may prefer a centralized email to let them know everything that’s going on at school — from testing schedules to who was awarded teacher of the month. Recruit a communications chair who can send weekly emails with the latest news. Instant Thank You - Buy blank, pre-stamped postcards from the post office and place a school logo sticker or stamp on one side. Flip over and write a few words of appreciation to teachers or parent volunteers on the other, and mail it off right after an event. Buy a stack before school starts and you are ready to show your appreciation all year long. Back-to-school season is full of anticipation and planning, but it can be simplified with a few tips and tricks that you might not have thought about. Try some of these 50 back-to-school hacks to make your school year a breeze. Julie David is a former middle school teacher who enjoys volunteering in her daughters' schools and cheering on teachers any way she can. 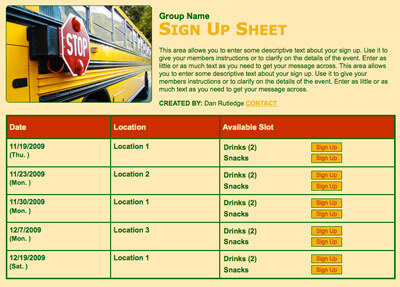 Organize class parties and field trips with a sign up!